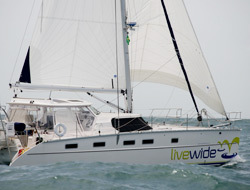 The most important design element of a liveaboard yacht is the helm. It should always protect you from the weather. Exposed helms can be fun on a vacation, but can undermine your long-term cruising experience. What defines a circumnavigation-class catamaran? We strongly believe that safety should always be a priority. Everything from steering to rigging aboard the Antares catamaran was designed to protect you. You may have noticed that Antares has never offered a choice between charter and owner’s versions, to do so would undermine the offshore integrity of the hull design. The enclosed cockpit aboard the Antares is designed to protect you from the weather, and not just for cocktail parties (though that's never stopped us before)! As a circumnavigation-class catamaran, the Antares is outfitted with a superior shaft drive system and not with sail drives. 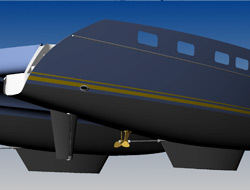 Shaft drives are not only more robust; it also means that the propellers are placed in a protected area at the end of the keel where there is minimal water disturbance. This also allows concentrated weight distribution amidships, keeping fore and aft pitching to a minimum and enhancing responsiveness and comfort at sea. This same focus on safety is reflected in the skegged rudders. 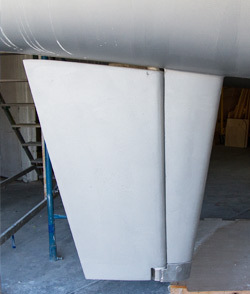 Instead of unprotected spade rudders that are often used to cut costs and simplify production, the fully skegged rudders aboard the Antares catamaran make the rudder stocks resistant to bending. Another detail to safety is a superior steering system intended for blue water sailing. The Antares catamaran is outfitted with a premium shaft and rotary gear steering system as opposed to cable or hydraulic steering. Another factor where safety is never compromised are the two watertight bulkheads - one inside each bow locker, as well as watertight bulkheads forward and aft. Fuel Capacity:	120 US gal. Water Capacity:	150 US gal. "If anybody is considering taking up the cruising lifestyle - just do it. The hardest part is actually setting off. The second hardest will be going back home." "No one said it was going to be easy. But nobody told us it was going to be so much fun! My husband Bob and myself, and our 5 hear old Aussie Mollie, have been living aboard our Antares 44-foot sailing catamaran in the eastern Caribbean for the past two years. "The Antares 44i catamaran is the perfect sailboat to liveaboard and cruise as a couple, and also be joined now and then by close friends and family."